I always feel so much joy when my Degustabox arrives at the door. It is like a little foodie gift to me each time and full of new and interesting things to try. If I didn’t recieve it, I probably wouldn’t discover half the quirky foods I now eat. 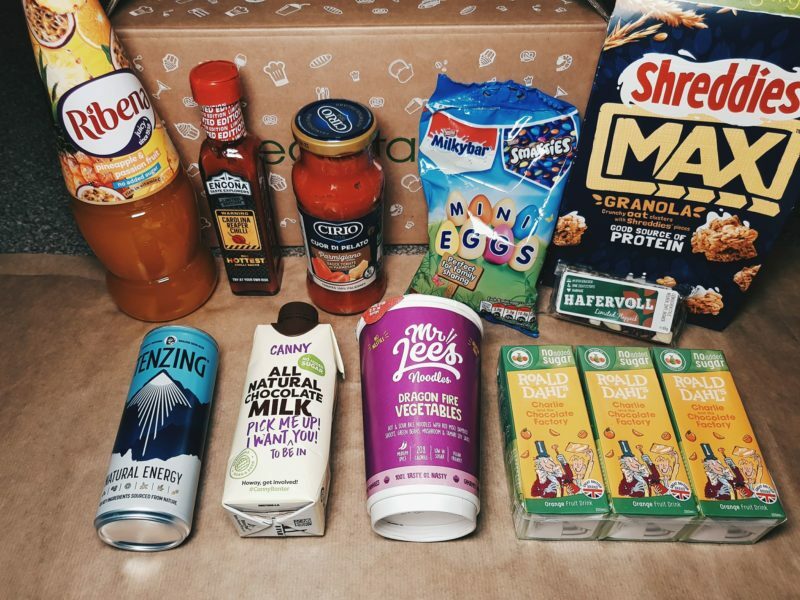 So, what do I think of the Degustabox UK March 2018? The initial smell of this pot was a little grim. However, I was impressed with its contents and the taste. Inside, you will find a combination of ribbon noodles loaded with a good mix of vegetables. I really liked the indication for noodle preference, showing you where to fill for a more soupy or solid noodle cup, as well as the addition of green beans. That was pretty neat. I am always hesitant with energy drinks but this pleasantly surprised me. It proved refreshing and bursting with natural taste without the usually harsh tang. It also had the same caffeine as a cup of coffee so proved perfect for a daytime venture into London. Fab, simply fab. What a combination and perfect just in time for the up-and-coming Easter festivities. These chocolate Smarties and Milkybar eggs were pretty sizeable and lasted about a solid day. Oops. This was certainly another treat and it tasted just like Christmas with a hint of cinnamon and brimming with chunky nuts. A perfect go-to snack for vegans and vegetarians from a fabulous German brand. This tasted like a cocoa-rich milkshake. Rather refined to the usual choco-milk affair. It might have something to do with the fact that it contains date nectar. It is a Northern brand so expect lots of slang and fun. This protein-boosting cereal is a great morning pick me up. These granola bites are packed full of oats and embellished with Shreddies pieces. After a bowl of these, you will be set till lunchtime. This authentic Italian sauce was spectacular, infused with delicious parmesan cheese. It made for a spectacular spaghetti bolognese one evening. Ribena is famed for its blackcurrants but this pineapple and passionfruit affair is pretty wonderful. A very adult squash to say the least. Bursting with flavour, it lasted about a week. I made the boyfriend try this one and it was certainly a spicy affair, it pretty much set his mouth on fire. A good condiment for those dishes requiring a little shazam. Made with the Carolina reaper chilli, this limited edition sauce is not for the faint of heart. The perfect lunchtime treat from Frobscottle Swiggle – refreshing and quirky. The illustrated cartons are very fun and the juice was simply delicious. Overall, this was a great box with a great mix of European products. I’d have probably skipped on the hot sauce but that was simply down to personal preference. It was great to try an array of products and many of them were new to me. I would pretty much buy everything again – minus that sauce! Like what you see? You can order the next Degustabox here. What do you think of the March Degustabox? What item would you go for first?